I hit a couple of snags while I was finishing the bathroom, mostly because I’d never done it before. It wasn’t anything major, but it slowed down my progress. My bathroom vanity finally arrived one afternoon and I thought (honestly!) that I would just install it after work. No big whoop. I got the thing unpacked and staged in the bathroom. It was pretty. I somehow came to my senses and realized that I wouldn’t be able to put it together after working ten hours. I should eat dinner, drink wine, and play with the dog instead. I should also go back to Home Depot because I hadn’t purchased the correct plumbing materials. Grrr. The following Friday I put together the sink, which required installing the faucet and the drain kit. In retrospect this would have been easier with a second person. 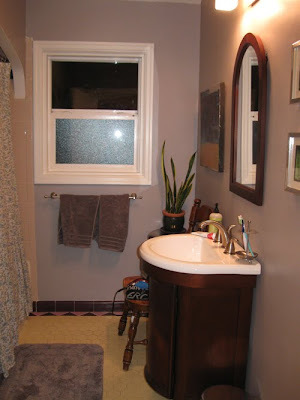 I had the sink cradled in my lap while I blindly tried to wrench things into place, all while keeping handles and spigot pointed in the right direction. This is harder than it sounds. It’s not anything that requires a professional but there is a certain finesse to doing it. I chose a faucet one step up from the "builder’s special," which is what they charmingly call the cheapest faucet available. I didn’t want to spend a ton of money (faucets are surprisingly expensive) but I didn’t want to cheap out, then buy another faucet in a year. 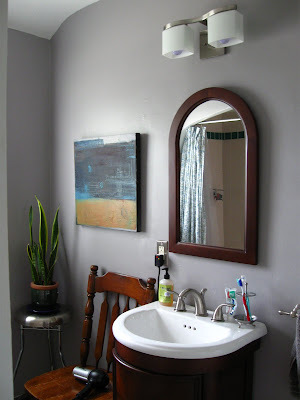 I chose brushed nickel, which seems to be really popular right now. Do you remember how everything in the 80s was brass and how outdated it looks now? I hope that doesn’t happen with brushed nickel. It will probably happen with brushed nickel. 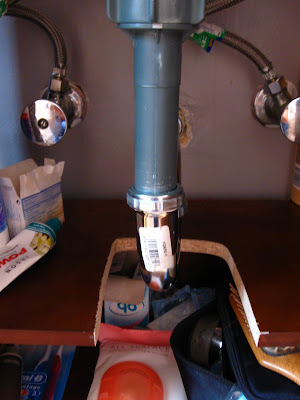 Once the faucet was installed I put a thin bead of caulk along the base and set the sink on top of it and then the weirdest thing happened: the sink was no longer flush with the base. It rocked a little bit. I shifted the sink around a little, and still it rocked. I have no idea what changed but I just hoped the caulk would magically fix the problem. And you know what? It did. My major problem with getting the vanity installed was a shelf installed inside. It was just high enough that it interfered with the P trap of the drain. I thought, “Well I’ll just remove the shelf!” Who needs a shelf? I removed the screws only to find that the shelf was glued in. Really tightly. I tried to fudge it and install the plumbing anyway, resulting in a bit of uptilt of the P trap, but this made the drain leak. Ultimately I borrowed a jigsaw from the North Portland tool library and cut out a little spot for the pipe to hang. It doesn’t look that great, but nobody should know but me and my roommate, right? It took me about a week to stop checking the drain to see if it was leaking every time I used the sink. I still check every once in a while, sure that my work will fail. My friend Keith came over and taught me how to change out a light fixture and I hung some artwork. 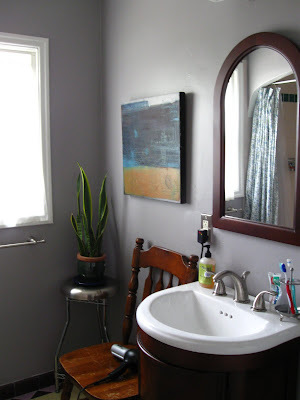 I think I like it even better than the pedestal sink I had planned.